Every apartment features comforts like 9-foot ceilings and upscale flooring throughout. Gourmet kitchens include granite countertops, stainless steel appliances, side-by-side refrigerators, over-the-range microwaves, 42-inch kitchen cabinets and under-mount sinks. Enjoy the convenience of full-sized in-unit laundry and garbage disposals. Every apartment also has a dedicated entry-way closet, linen closet and kitchen pantry. 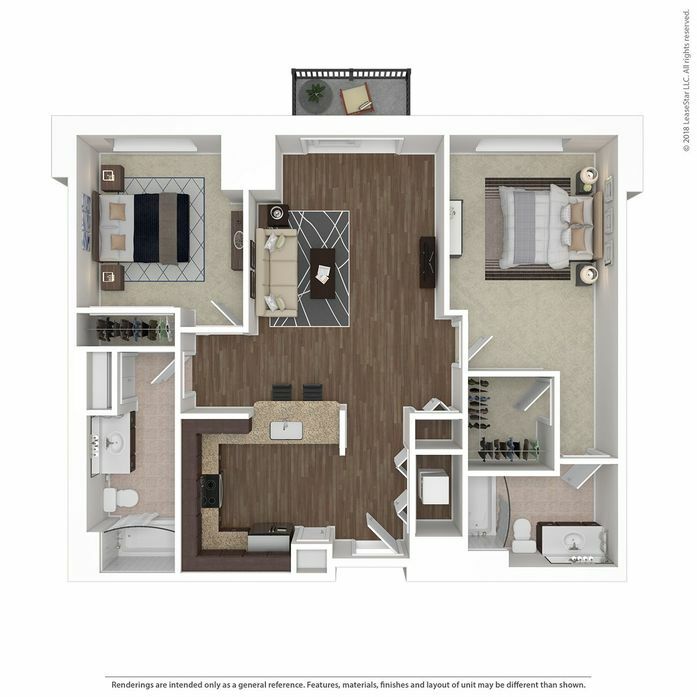 The one bedroom apartments range in size from 692 square feet to 953 square feet. Each bedroom features a large walk-in closet in the spacious bedroom as well as a large sliding door that faces the exterior of the building or the interior courtyard in the living room. Each kitchen in every one bedroom apartment features either a pass-through window or breakfast bar with direct views to the living and dining spaces creating an open-concept floor plan perfect for entertaining or just watching TV while you prep a weeknight dinner. Relax after a long day on the couch and enjoy a cool breeze by opening the sliding door that is adjacent to the living room. Five of the one bedroom floor plans, the Warhol, the Monet, the Renoir, the Escher and the Picasso feature a private patio or balcony. The two bedroom floor plans share many of the same great features as the one bedroom floor plans. These range in size from 1,152 square feet to 1,517 square feet. Each spacious master bedroom features a full en-suite bathroom and a walk-in closet. Four of these styles, the Degas, the Van Gogh, the Pollack and the Dali feature a breakfast bar, and the fifth style, the Matisse features a convenient kitchen island. The large kitchens, in addition to pantries, offer ample cabinet space. Each two bedroom also features a large private patio or balcony adjacent to the living room.